Time for a pop quiz, hotshot MinerBumping reader. An Agent of the New Order has finely-honed instincts. More often than not, they can size a person up just by taking a look at their profile. We call this process "profiling". I'm going to show you two profiles. Can you tell which will be the hero and which will be the villain of today's story? ...Baunty Brown. One is the hero, and one is the villain. Ready? Let's see how you did. Did you guess correctly? 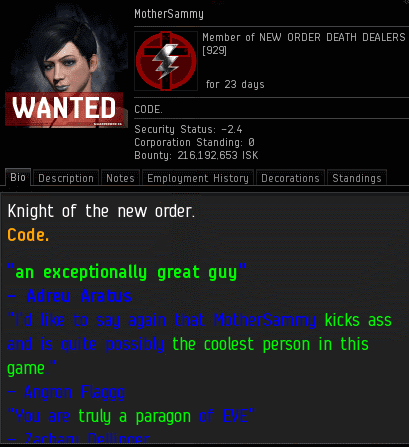 This wasn't a trick question or anything; I'm the Saviour of Highsec. I'm here to help you, not trick you. 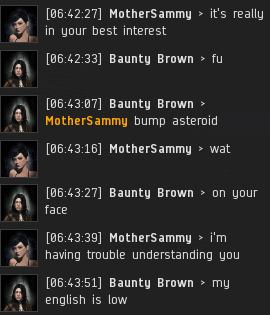 Agent MotherSammy located Baunty Brown's Retriever illegally mining in an asteroid belt. Within seconds, MotherSammy had deployed a bumping ship and implemented corrective action. Baunty was defiant. She couldn't understand English very well, but she could tell she was being bumped. And she didn't like it. It was a stalemate. Baunty thought she could wait out an Agent of the New Order. This is a common mistake. The New Order isn't going anywhere. We'll have many years to spend convincing miners to obey us. 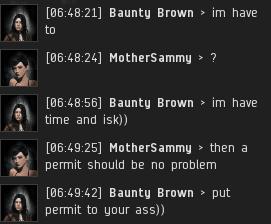 I was very impressed by Baunty's first comment, "other miner can mine when you bump my))". That's your classic Miner Bingo line: "Bump me and you can't bump anyone else". This proves that even a miner who can't speak English is capable of filling out your Miner Bingo card. Extraordinary! Under the strain of twenty minutes of continuous bumping, Baunty started to give out intel. MotherSammy had earned her stripes as an expert interrogator. The New Order doesn't believe in using torture. We induce miners to give us intel by establishing a good rapport with them. Which is just as well, as everything we do is necessarily defined as "not torture" under the Code, since we're the good guys. It was fate. 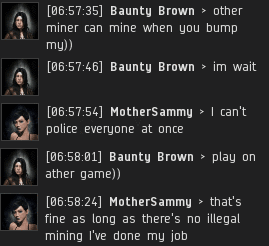 Baunty's illegal mining operations were supplying MotherSammy's Code-enforcement operations. 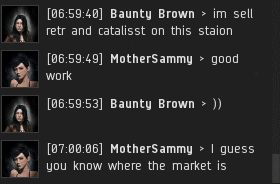 Baunty was more than willing to sell out her fellow miners for a quick isk. But she assumed that she would never find herself on the receiving end of any of those Catalysts she was selling. Realizing her mistake, Baunty quickly dropped her "wait them out" tactic and retreated from the asteroid belt. 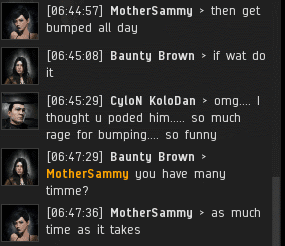 Violence was imminent--and only one EVE player would walk away from it. 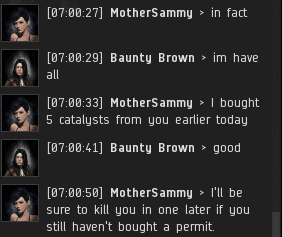 I REALLY hope that this one ends with Baunty being ganked by one of his own catalysts. I love the idea that he is going to get his ship blown up by his own cat. I think this needs a video and some music. Not one but 3 of her own catalysts killed her that day. Question: if you are comparing profiles, Why was the Hero's bio shown, but the Villains bio not? it shows "Decorations" instead. Does that mean the Bio was blank. 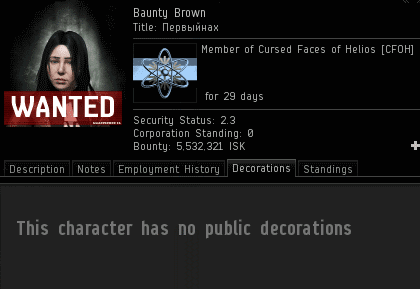 In which case, would you not have taken a picture of a Blank Bio instead of a Blank Decorations tab? And if it was in error, should the Hero's screen capture not show the Decorations tab instead? Or wait.. are you implying that its irrelevant. Or are you implying that just like taking proxy to become supreme ruler, you take proxy in the regalation of the intelligence of the reader. why must you be so confusing? and finally. To all the haters out there. I really dont care what you have to say, as i am addressing James315, so if you could please keep your comments to yourself, that would be great. I pity the fool who questions the Supreme Protector! What the hell are you talking about? you make no sense. Can't you see that MotherSammy is taking care of business? What a goon. cry some more.